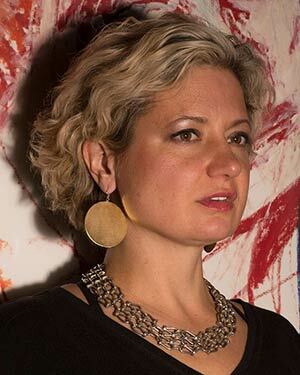 Joanna Berzowska, Associate Professor of Design and Computation Arts at Concordia University, stood out right at the start of her career because of her creative and innovative approach to developing new technologies. Beginning with two degrees in Design and Mathematics, she became a world leader in electronic textiles and wearable computers, focusing on inventing revolutionary technologies. internationally. She speaks out regularly to raise the visibility of women entrepreneurs, presenting papers at science and technology events. She firmly believes that electronic textiles is an ideal field to spark the interest of women and girls in science and technology. It is a fast-growing field. Electronic textiles are becoming more and more popular, and Québec is a leader in developing this new technology. Joanna Berzowska lectures on her research and presents her textile creations the world over, for example in Mexico, Britain, the United States, China, Australia and Japan. Joanna Berzowska worked with the team at OMsignal to develop the concept of the first biometric sensing shirt for Ralph Lauren. The PoloTech Smart Shirt picks up data related to the effort made in physical exercise and relays them to a watch or smart phone. For example, it will record your heart rate, measure your breathing and make the calculation. It’s not science fiction—it’s on the shelves right now! Joanna Berzowska’s expertise and major contribution to the Montréal startup OMsignal and other businesses are having an impact on young people, particularly women, wanting to follow in her footsteps. She also volunteers outside the university community with young people by taking part in prestigious digital technology events such as TedxYouth Montreal, Fusion Jeunesse, AngelHacks and WearHacks Montréal. She sits on the board of directors of District 3, which stimulates new talent and brings people together to develop innovative ideas and start their own company. Joanna Berzowska’story may sound like a movie script, but it’s only too real. And this is surely only the beginning!